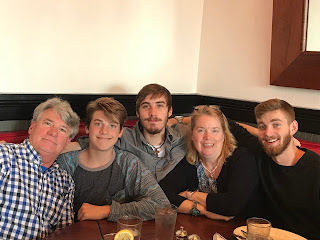 I like to look at this picture of my family from Mother's Day 2018. It makes me proud. Those men are so good looking! Yes, the Gman and I produced those handsome boys. But who is that lady with the double chin sitting with them? Yes, that's me. Now my oldest, the writer has a wedding coming up. It's been quite stressful thinking of mother of the groom dresses. I'd love to say that I wanted to lose weight because I want to be healthy for the long awaited grandkids. Or at least because my body is the temple of the Holy Spirit and heartburn was not dwelling in the same place. But the truth of the matter was....some awesome photo opportunities will be coming up in October and I can't look like Shamu. Pride, yes, thank God for pride. Not the one that causes one to fall, but the motivator pride. The kind that makes you lick your finger and quickly wash your kids face at the pediatrician so they won't think you are a bad mom. I was able to pull out the emotion exactly three months before the wedding. Serious times caused for serious measures. I joined an expensive health club, actually showed up faithfully and accepted their so called "food plan" which in reality was a 2 page chart with the most mundane deprivation diet ever. This was planned on the week that Little Guy was away for camp at Gordon College. The Gman was on his own for meals. The first week included an evil trainer named Amy who yelled, swore and called me by my last name, sort of like boot camp 3 days a week. I had to nap a few times just to get out of my misery from eliminating sugar. I googled it. They liken it to a flu when you are detoxing. Of course it didn't help that I downed a ton of sm'ores the night before I started this journey. But I survived the week and lost 4 pounds. Hmm, if I keep this up, I may even get my money back, from the fitness challenge. Amy said she was proud of me even though I was a pain in the....There's that pride word. I actually stuck like glue to the food chart, worked out or walked killer hills and each week weighed in. It worked! In just over the 10 weeks, I lost 24 lbs, feel amazing and am super happy with the dress I picked out. It was very simple. I stuck to it with the exception of one evening, I cheated one night while taking clients out to dinner and I felt terrible. 1) You look awesome, you inspire me................ What must I do to be thin/saved? 3) I love my sweets/junk food too much...........I love my sin too much surrender to Christ. 5) I don't have time for all the food prep and exercise.......My life is too busy for God. Now that I have experienced the transformation I was looking for, I have to be careful not to become prideful. Or self righteous................. And that's another battle. So I may have collectedly offended all 5 of my readers in one post. I've taken my terrible habit of stress eating and focused on taking care of myself. The Gman still can't believe he hears me leaving early for a morning run even in the rain. I wish I could market this weigh loss plan with a flashy name and sell it to the many Americans who spend so much money on weigh loss products. Hmm.....the possibilities are endless. Stay tuned for an after picture.